1. Mamta Saini, V. L. Gupta and Enakshi K. Sharma, “High-extinction ratio metal-clad GaAs/AlGaAs waveguide polarizer,” Microwave and Optical Technology Letters (USA) 8, 75-77 (1995). 2. Mamta Saini, Enakshi K. Sharma and M. P. Singh, “Strong effect of output coupling on the performance of metal-clad waveguide polarizer,” Optics Letters (USA) 20, 365-367 (1995). 3. Mamta Saini and Enakshi K. Sharma, “Equivalent index of multiple-quantum-well waveguides using variational analysis,” Optics Letters (USA) 20, 2081-2083 (1995). 4. Mamta Saini and Enakshi K. Sharma, “Analysis of Nonlinear MQW waveguides : a simple numerical approach,” IEEE Photonics Technology Letters (USA) 8, 384-386 (1996). 5. Mamta Saini and Enakshi K. Sharma, “Equivalent index of MQW waveguides,” IEEE Journal of Quantum Electronics (USA) 32, 1383-1390 (1996). 6. 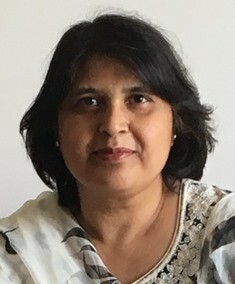 Sangeeta Srivastava, Nisha Gupta, Mamta Saini and Enakshi K. Sharma, “Power exchange in coupled optical waveguides,” Journal of Optical Communication (Germany) 18, 5-9 (1997). 1. Mamta Chowdhury and Enakshi K. Sharma, “Propagation characteristics of MQW waveguides,” Proceedings of National Symposium on Recent Advances in Microwaves, New Delhi India, Mar 2-3, 1993. 2. Enakshi K. Sharma, Mamta Saini and M. P. Singh “Modulation characteristics of directional coupler modulators,” Proceedings of International Symposium on Recent Advances in Microwave Technology, New Delhi-Agra, India, Dec 15-18, 1993. 3. Mamta Saini, V. L. Gupta and Enakshi K. Sharma, “GaAlAs buffer layer on metal-clad GaAs/GaAlAs waveguide polarisers,” Proceedings of International Symposium on Recent Advances in Microwave Technology,New Delhi-Agra, India, Dec 15-18, 1993. 4. Sangeeta Srivastava, Nisha Gupta, Mamta Saini, and Enakshi K. Sharma, “Power exchange in coupled optical waveguide,” Proceedings of 1994 Asia Pacific Microwave (APMC), Tokyo, Japan, Dec 6-9, 1994. 5. Mamta Saini, and Enakshi K. Sharma, “Optimization of electro-optic directional coupler modulator,” Optical and Opto-electronic Instrumentation, Chandigarh, India, Mar 29-31, 1995. 6. J. Lalitha, Neeru Kumar, Mamta Saini, Sangeeta Srivastava and Pratibha Jolly, “An investigation of physics students’ concepts in basic electric circuits,” International Conference on Physics Education, New Delhi, Aug 21-26, 2005.